Comedian John Clarke has died, aged 68, but he lives on through our collections. Curator Stephanie Gibson recounts the story of how Te Papa acquired beloved Kiwi everyman Fred Dagg’s iconic outfit. Te Papa mourns the passing of John Clarke. To many New Zealanders he is Fred Dagg. Fred Dagg appeared on New Zealand television in 1973. Only three hours of screen-time were recorded over a three-year period, but he struck a deep chord with New Zealanders and is still instantly recognisable in his crumpled hat, loose black singlet, ripped shorts, and mismatched gumboots held in Te Papa’s collections. Although Clarke moved to Australia in 1977, Fred Dagg has endured in New Zealand memory and continues to be an icon of the 1970s. In 2002, Clarke decided it was time for Fred Dagg’s outfit to return to New Zealand and become part of the national collection. I travelled to Melbourne to meet with him and bring home the items. We had a wonderful conversation in one of Clarke’s favourite cafes where he regaled me with funny stories for three hours. I’ve never laughed so long before. He was incredibly generous with his time and experience. I then had to get Fred Dagg’s outfit ready for customs. It sounds simple, but Clarke had recently mowed the lawns in his gumboots and they were covered in mud and grass. So I had to quickly scrub them down in the hotel shower and blow-dry them before the customs agent arrived! In Fred Dagg, Clarke had wanted to create a character who was amusing and endearing, and recognisably from New Zealand (‘you can only do what you know’). He was able to create the look and sound of Fred based on experience, having spent time on farms while growing up and working in shearing gangs after leaving school. Like many rural workers at the time, Fred wore a hat, black singlet, shorts and gumboots. He appeared simple, almost rustic, both in dress and speech, but had a smart, satirical, and surreal view of New Zealand culture and politics. His humour was subtle, allowing the audience to meet him halfway. Most of Fred’s outfit was recycled. The shorts were trousers ripped off at the knees from the New Zealand Broadcasting Corporation’s wardrobe. 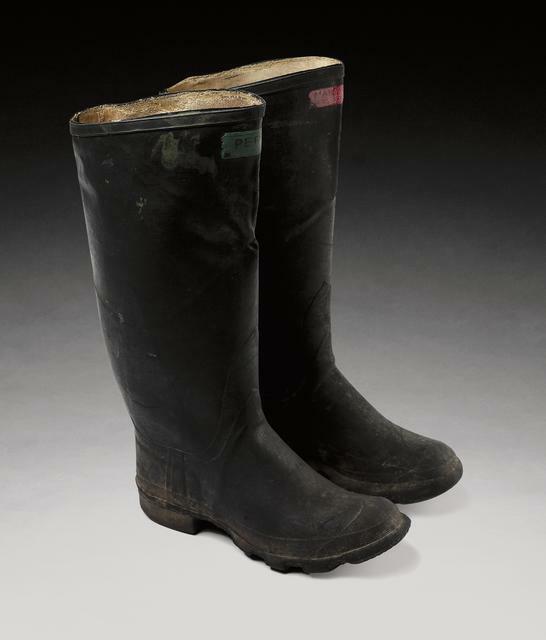 The gumboots were a mismatched pair ‘found somewhere’. The black woollen singlet was inspired by sheep shearers and therefore ‘obligatory’. Fred Dagg’s immediate popularity meant that once Clarke had established his outfit, he felt that he couldn’t change it even if he had wanted to. Clarke himself once said of his audience: ‘I’m in their memory and it’s a precious place to be’. Blow drying the gumboots? Perfect. Great article. I loved his programmes!